Photo H.D. 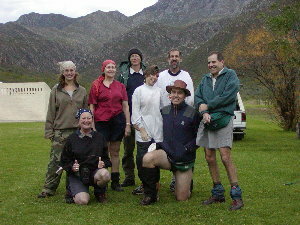 Oschadleus 28/05/2002 (Day 1) Start of Swartberg hike: Ramona, Marie-Paule, Dieter, Jenny, Vincent, Paul, Margie, Conrad. Photo H.D. Oschadleus 28/05/2002 (Day 1) Folded rock formations. 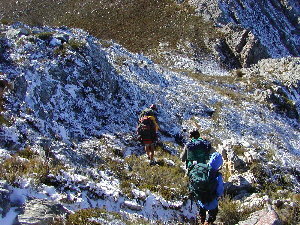 Our route on the first day was from De Hoek campsite to Gouekrans hut, starting with a long steep ascent, and a total distance of 12,1 km. Photo H.D. Oschadleus 28/05/2002 (Day 1) Protea Canary feeding on protea at Gouekrans hut. Photo H.D. Oschadleus 28/05/2002 (Day 1) View north from Gouekrans hut. Photo H.D. Oschadleus 29/05/2002 (Day 2) We started hiking from Gouekrans in light rain, which turned into icy sleet and then snow by the time we arrived at Bothashoek hut. Distance 13 km. Photo H.D. Oschadleus 30/05/2002 (Day 3) Sunrise at Bothashoek hut, with a light covering of snow on the ground. Photo H.D. 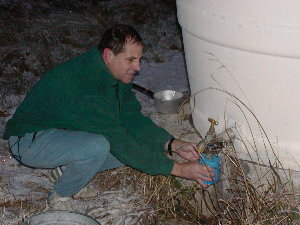 Oschadleus 30/05/2002 (Day 3) The water in the tap at Bothashoek hut was frozen early in the morning so Paul heated the tap with his gas cooker. Photo H.D. 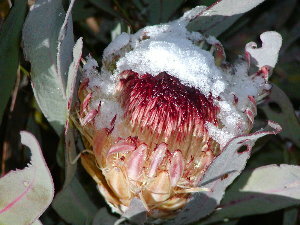 Oschadleus 30/05/2002 (Day 3) 'Snow Protea' Today was sunny and we could start drying out on our hike from Bothashoek to Ou Tol. Distance 13 km. Photo H.D. 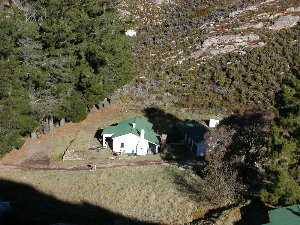 Oschadleus 30/05/2002 (Day 3) Ou Tol hut from koppie. 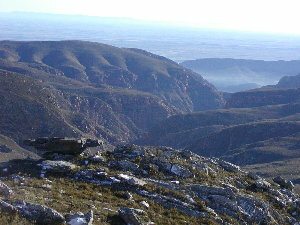 The Swartberg Pass road runs past behind the pine trees. We sat in the sun against the wall of the hut to thaw out! Photo H.D. Oschadleus 31/05/2002 (Day 4) We hiked from Ou Tol to Bothashoek along the summit route, distance 12.6 km. 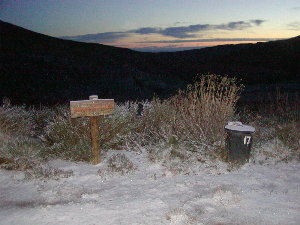 Another sunny day, otherwise the summit route would not be possible. 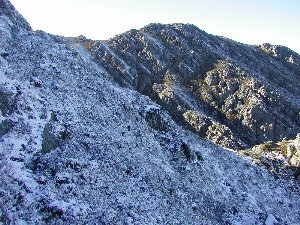 There was still snow on the shaded south slopes. Photo H.D. Oschadleus 31/05/2002 (Day 4) More snow on the summit route. Photo H.D. Oschadleus 31/05/2002 (Day 4) View of Gouekrans cliffs from summit route. No snow left on the northern slopes. Photo H.D. 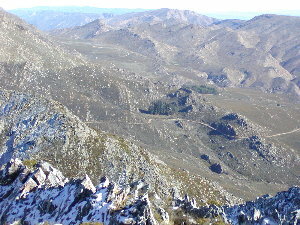 Oschadleus 31/05/2002 (Day 4) Looking back at Ou Tol hut and the Swartberg Pass road from summit route. Photo H.D. 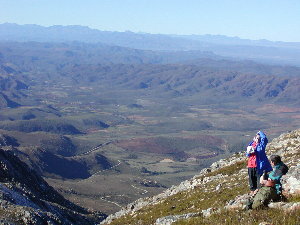 Oschadleus 31/05/2002 (Day 4) View from summit route overlooking Outeniqua Mts. Photo H.D. 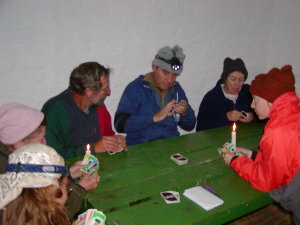 Oschadleus 31/05/2002 (Day 4) Our last game of Uno in Bothashoek hut on our last night on the trail. 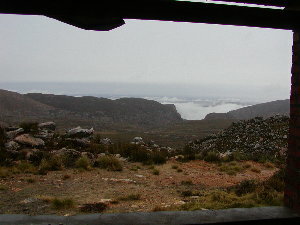 The next day we descended from Bothashoek to the De Hoek campsite in heavy rain which abated as we descended. Distance 8.7 km. 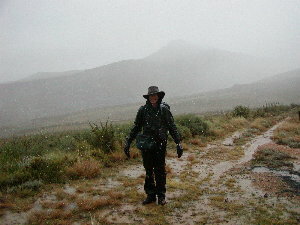 Only 15 species were recorded on the trail, partly because of the bad weather on several days. 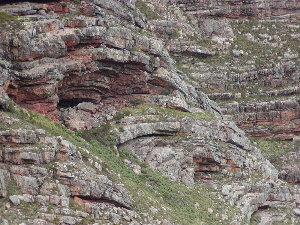 The most recent checklist for the Swartberg is: Dave Osborne and Rob Little, 1999, Birds of the Swartberg and Gamkapoort Nature Reserves (see ADU publications). Birds marked with * below indicate a new month record for the species. This list is only on the trail, not including the De Hoek campsite. 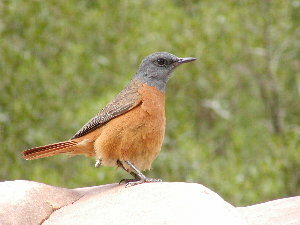 The most frequently recorded species was Orangebreasted Sunbird. 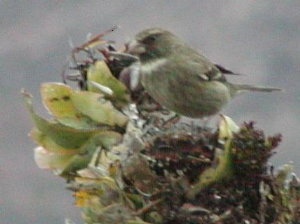 Cape Siskins were seen several times in flocks of 20-30 birds; they were often seen foraging in the worst weather, including snow and rain.